April | 2016 | "Limesstones"
“Jonathan Appell is a gravestone conservator and monumental mason, performing cemetery preservation planning and conservation projects throughout the United States. He conducts the vast majority of gravestone and cemetery monument preservation seminars held nationally, hands on training workshops to help towns, cities, churches, historical societies, cemeteries, and individuals gain knowledge and experience in all areas relating to gravestone and monument preservation, historic masonry preservation planning and stone conservation treatment techniques. Jonathan has been working in fields relating to gravestones and monuments for well over 20 years. Prior to devoting himself exclusively to stone and historic masonry preservation, Jonathan attended violin making school, constructed cabinets, built houses and additions, as well as performed many other related trades. He became a modern monument installer and cemetery contractor in 1986, and founded the New England Cemetery Service, performing excavation, foundations, monument installation and monument restoration. Jonathan Appell has several cemetery preservation workshops scheduled for 2016 in western states. As he will be traveling through Ohio, he has some availabilty of time to hold a workshop in Ohio. If an organization wishes to schedule a hands-on cemetery preservation workshop conducted by Jonathan Appell, please contact him directly. Sharing colorized version of a circa 1890’s photo of Sarah Catherine (Duvall) Limes. Read “Is a Historic Cemetery Right for You?” and other helpful articles from The Burial Advisor, the official BurialPlanning.com blog. 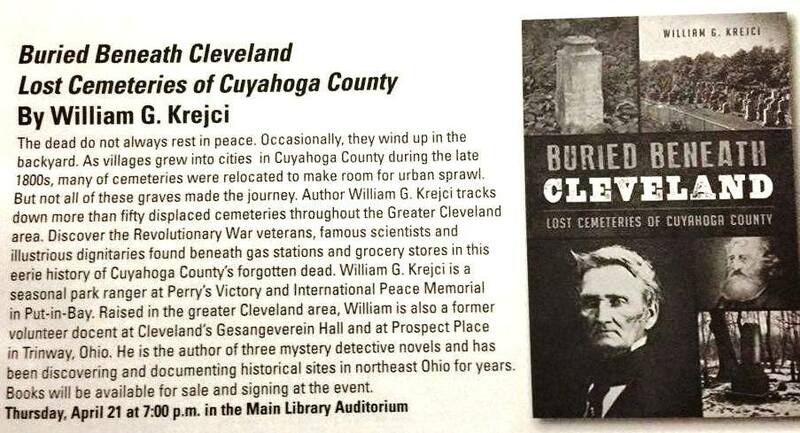 Reminder: “Buried Beneath Cleveland: Lost Cemeteries in Cuyahoga County” Presentation by the Book’s Author, William G. Krejci – Lakewood Public Library, Thursday, April 21st, 2016 at 7:00pm. If you missed attending the presentation by William G. Krejci at the Avon Lake Public Library this past week, you will have another chance coming up to attend one next week at the Lakewood Public Library. The next presentation is scheduled to be held at the Lakewood Public Library, on Thursday, April 21 at 7:00p.m at the Main Library Auditorium. “The dead do not always rest in peace. Occasionally, they wind up in the backyard. As towns grew in Cuyahoga County during the late 1800s, many of its cemeteries were relocated to make room for urban sprawl. But not all of these graves made the journey. Author William G. Krejci tracks down more than fifty displaced cemeteries throughout the Greater Cleveland area. CIRCLEVILLE, Ohio — Ed Thompson knelt over his father’s grave Tuesday afternoon and, using a trowel, scraped the hardened dirt until it loosened enough that he could spread it into the deep holes that had formed just since his last visit. Then he moved on down the row to the freshly dug grave of a man he had never met and did the same thing. Then another. And another.